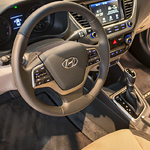 On the connectivity front, the 2019 Hyundai Accent offers both Apple and Android lovers their choice of the CarPlay or Android Auto systems. Individuals without access to those technologies can always make use of the included 7-inch Accent touchscreen. In addition, drivers will appreciate the convenience that the Hyundai voice recognition system affords.